Note to visitors: 1. The phrase "we-go" in this post is borrowed from George Klein's 1976 book, Psychoanalytic Theory: An Exploration In Essentials. It refers to affiliative "we-ness" aspects of identity (leanings toward membership in social groups, selfhood characteristics derived from such membership) that have to be integrated with or balanced against autonomous "I" aspects of self. 2. Quotations from the Gospel of Mark are taken from the King James Version of the Bible. 3. Richard Shindell's song "Gethsemani Goodbye" is from his 2009 CD Not Far Now. 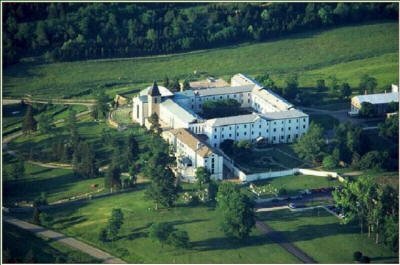 It tells of a man driving with his partner to the Abbey of Gethsemani near Bardstown, Kentucky. The man gets lost, won't ask for directions, eventually gives up looking and turns back to Louisville. The driver missed relational as well as road signs to Gethsemani. The lyrics suggest that pride trumped empathy, the willful driver failing not only to stay the course, but failing to remain an interpersonally present witness to his friend's needs. Ego trumped we-go. The lyrics and somber vocal timbre, the past tense and verse repetition –– all indicate that something that was has been lost, perhaps irretrievably. Short-sighted by pride, the driver was shuttered to the landscape of his partner's needs. He "went too far," lost his way, broke a bond. He would have had to ditch that pride in order to be open to relational witnessing. What does "witnessing" mean, anyway? Stripped of its utilitarian crime-scene and document-signing contexts, it carries the sense of being present at an event, having knowledge of something, standing up for and vouching for something. The "wit" in "witness" relates to knowledge and knowing (cf. witty, witless, half-wit, outwit). "Witness" is also a visual word, pointing outward: one sees what's happening in a setting, attends to something. One typically is an eye-witness. And there is ordinarily a pull toward witnessing, at least as regards Big Events. Some may recall the popular TV program You Are There! (1953–1957). Hosted by Walter Cronkite, the show recreated historical episodes, allowing viewers to become witnesses. Less nobly, there are gossip shows and magazines, celebrity Facebook and Twitter pages, the allure of the peephole, the chance to glimpse. But Shindell's song shows a failure to witness on a smaller scale, with a couple in a car driving to Gethsemani, Kentucky. And this is the song's power. Everyday life is not the Pageant of History; the couple in "Gethsemani Goodbye" are not Crossing the Delaware, they're on Bardstown Road. The driver is with a friend, not the Secretary of State or head of the World Bank; not, that is, with someone whose star-power might otherwise compel attentive regard. Presumably it would have taken effort for the driver to muzzle pride, open those shutters, let in knowledge of the other. 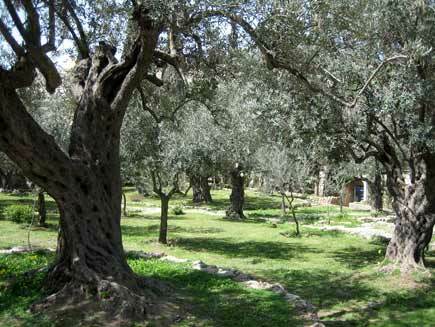 Now a song about Gethsemani necessarily recalls another Gethsemane (with an e not an i), that garden of olive trees in Jerusalem where Jesus prayed the night before he was crucified. This connection between Gethsemani, Kentucky and Gethsemane, Jerusalem could not have been lost on Shindell –– whose biography states the "occasionally spiritual" nature of his songs and notes his having attended Union Theological Seminary. He seems to be anchoring a present scene in a relevant past. Let's away to Old Jerusalem then, actually to the Gospel of Mark (c. 70 AD), the first of the four canonical gospels and the template for the others. tarry ye here, and watch. prayed that, if it were possible, the hour might pass from him. In the next verses, Jesus gets up to find that his disciples have fallen asleep. 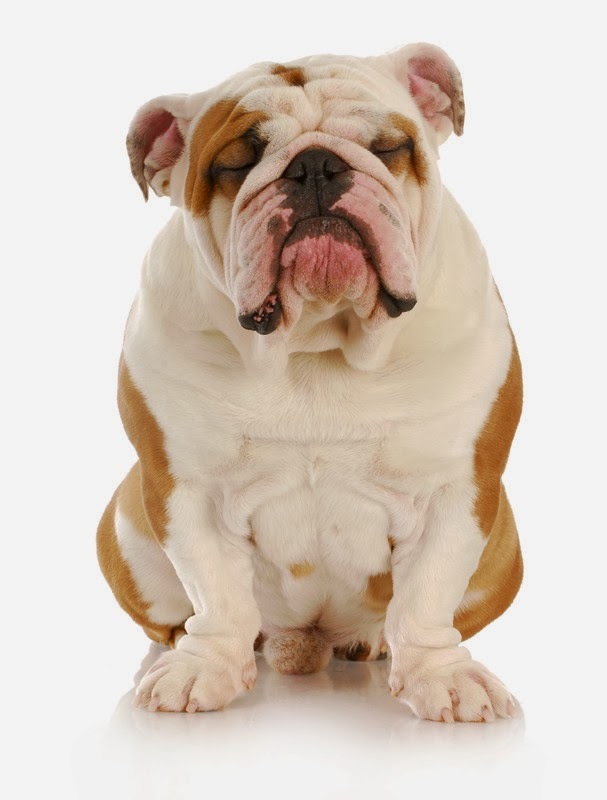 He chides Peter for having been unable to stay awake, even for an hour, for letting physical exhaustion (needs of "the flesh") supplant spiritual readiness. Peter, Simon, sleepest thou? couldest not thou watch one hour? is ready, but the flesh is weak. eyes were heavy,) neither wist they what to answer him. "It is enough ..." –– there is an interior and lonely quality to this. Are these words of Jesus uttered to slumbering men who can't hear them? If so, why? Or are they more a thought, a solitary interior monologue of painful acceptance? In either reading, the aloneness of Jesus in the midst of others is striking. This emphasis on human connection is brought home by references in "Gethsemani Goodbye" to 'Merton' and to Gethsemani itself. 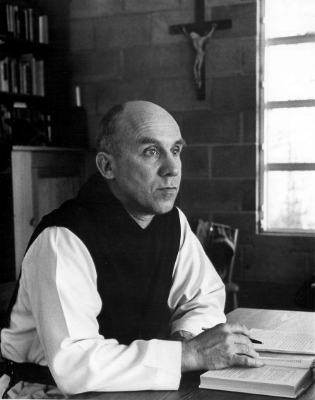 Merton would be Thomas Merton (1915–1968), a Catholic monk who lived for twenty-seven years at the Trappist Abbey of Gethsemani in Trappist, Kentucky. Merton was a writer, poet, social activist, advocate for interfaith dialogue; and he was eloquent in his belief that participatory service was a valuable end in itself. It outweighed any ideology to be furthered, mission to be accomplished, truth to be celebrated through such participation. Communal doing is what counted, not proselytizing or crowning achievement, not ego but we-go. And then this: do not depend on the hope of results. but on the value, the rightness, the truth of the work itself. reality of personal relationships that saves everything. and will be less crushed by the inevitable disappointments. I read in this a humility –– an awareness that social good, if it happens, likely happens outside of our control; that the "reality of personal relationships" matters more than outcomes and achievements, and that serving "Christ's truth" involves getting past ego-claims so as to place ourselves in the minds of others; finally, that we lose sight of this "truth" when "engrossed with ideas and slogans and myths." In the Christian story, this has to do with sacrifice and being a good shepherd. We resist certain temptations, the ones that seem so natural, the satisfactions of bodily imperatives and those of ego (being right, strong, competent, self-sufficient) –– not all the time, but when a kind of ego-martyrdom will further friendship. Although this message from Merton is personal advice given in 1966 to Jim Forest, its themes match those in Shindell's song. Sometimes it is better not to scratch an itch, the better to bear witness to another's nature. staves, from the chief priests and the scribes and the elders. and saith, Master, Master; and kissed him. In everyday speech, to kiss something goodbye is to consider it lost, to not expect to see it again. 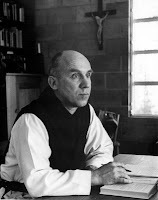 When Shindell's headstrong driver kisses Gethsemani goodbye, he loses whatever Gethsemani and Thomas Merton represent: an experience of humility, a personally significant relationship, a sense of fellowship in service to others. When Judas kissed Jesus, he kissed those same things goodbye. "Gethsemane Goodbye" is a compact, resonant, poignant song. Seemingly simple, it works as a parable in which a mundane story bears an old and continually retold truth: we need to get outside our heads and into the swim of persons. Hadn't thought of that, Matthew. Yes it is, in a shuffling sort of way. Hi Anne. Of course the friendship endures. Don't know what's going on with the Comments function thing; your last comment worked fine. Fantastic as always, Uncle Kit. Thank you, J-P. That's a very nice compliment. I get the distinct feeling that you are doing a lot of the thinking for the rest of us, Kit... Well done! It's especially welcome during this busy season, when even a list doesn't help us remember everything we need to do... Thanks for reminding us of one of the reasons "tis the season"! Thanks Penny. As always, you're a good cousinly pal.